This set contains 1 Aspen whisky decanter and 2 pieces Aspen whisky tumbler. 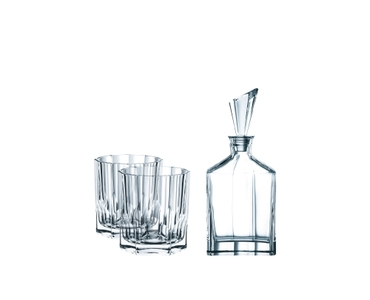 The opulent machine-made decanter of the brilliant glass collection Aspen is the must-have of the season. The decanter with stopper is ideal to store whisky in an elegant way. The two matching tumblers let you enjoy whisky at its best. ASPEN is a classic in the NACHTMANN collection. With its strong masculine shapes and cuts it does not only serve whiskey it also represents a lifestyle. As all NACHTMANN crystal this item is dishwasher safe.